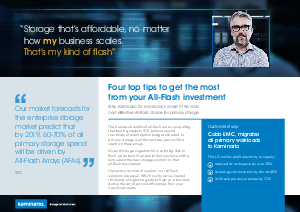 The business benefits of all-flash are so compelling that leading analysts, IDC, believe around two-thirds of all enterprise budget allocated to primary storage over the next few years will be spent on these arrays. Given this huge migration from spinning disk to flash, it’s essential that you have all the facts about the new storage economics that all-flash has created. However, one note of caution – not all flash solutions are equal. Which is why we’ve created this handy at-a-glance guide to help your business derive the very best cost-efficiencies from your new investments.